One pair, diagonal across the tread. Make an offer. They are 490 mm diameter. Collect only inner east Melbourne - they are too bulky and too heavy to ship. Make an offer. Do you have the number size on that piece of paper? I have no idea what these numbers mean. My Enigma is broken and I cannot decode the numbers. The enigma code is tyre width/tyre profile (ratio of depth to width as a percentage) - rim diameter. You can read this information from the sidewall of your tyres. The important number is that 720 because those chains will fit a few more tyres than the combinations listed. I'd take them but it's a bit far to drive. Good chains, that is what I have used for decades, I think I paid $25- in an Op-Shop in Bright but it may have been Mt Beauty. Moondog55 wrote: The important number is that 720 because those chains will fit a few more tyres than the combinations listed. ...what's your understanding of what the 720 denotes? I dont see any logical reason why a manufacturer would leave compatible sizes off a product - that would only deny themselves a larger market. My education has been that the tire profile list is the authority on what the chains are designed to work with, accounting for all aspects of the profile. Even if they appear to fit on other sizes, they're likely to load tension and slack in places they shouldnt once underway. Additionally, if you're caught using improperly sized chains, that can have some fairly serious ramifications in terms of resort access and worse, insurance. I know one fella who had his claim voided because he shoehorned chains from the family car onto the work ute and the inspector caught on. I was going to post a picture on my own "720" chains with the full fitting tables but realised that that went up in flames when my ute got torched [ chains still usable tho] and the Rud Archive is no longer available on the web it seems. Always some wriggle room with old fashioned chains because tyres are not the same size as we would like to presume, different makes use different lug and tread patterns etc and tyres wear so chains need to be adaptable. When I bought my chains the package still included the repair links and spare chain sections to allow the chains to be adapted to larger rubber if needed, I don't think that they had ever been used. I've had chains posted to me and posted them toothers. If chains fit and are properly fastened it desn't matter what it says on the package - they fit. The notion that in such circumstances any inspector would know (or care) is a bit of a stretch for me. To me, it looks like 49 720 is just part of the barcode - ie a product id, not a size. Tyre sizes are given to match chain and suitable tyre. If the chain safely fitted another size, it would be listed. MD is correct. It is common for manufacturers to have a sizing code for each size of chains. The code is not expressed as a tyre size. A given size code may well fit less common sizes which are not listed on the label. Manufacturers usually have a separate listing which shows which tyre sizes are LIKELY to be fitted by which size code. This separate listing can sometimes be more helpful than the package info., but good luck trying to find the listing anywhere - thought is not encouraged in our society. Whether or not the "720" on Lops chains is the sizing code or simply a product ID, I have no idea. The label also has (684) on it, which may be the size code. On probability "720" is most likely to be the code, and it would make sense to include that info on the barcode, as price and stocking considerations will be governed by the size code; and by a product code, which could be "49" - or vice versa. Easy enough for MD do some calculations from the actual sizes listed (Pi is your friend) and see if they are close to the tyres he now has. If they are close, a trial fit is still smart for the variable reasons MD has listed. It's also pretty easy to shorten or lengthen chains a little, but diamond pattern have far less flexibility to do this than simple ladder chains. Lops - the label also says they weigh 5.2 KGs. That would be a doddle to post, and depending on distance, destination, and state borders crossed, postage could be quite reasonable. As little as $10/$15. FWIW, when I bought my chains (used), the chart on the packaging didn't list my tyre size, but I cross checked it against a more comprehensive chart to identify which suited. 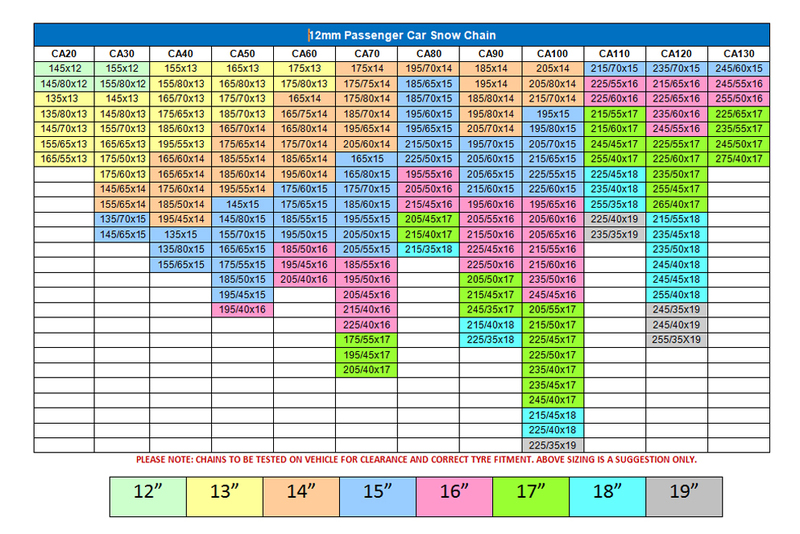 The chains for sale ITT are equivalent to CA60 in the chart below, with twice the number of options. (These tyres are approx 70-74" circumference, 720 could relate to that, or it could be a coincidence). The chains are gone but I'm leaving this thread open - there's interesting information about chains. There's a lot of useful information in the above posts, so I renamed the topic and moved it to the general discussion area.